Stealth based gameplay can be a difficult task for a developer. It is a challenge to keep things fresh when stealth can lend itself to repetitive gameplay. There are only so many ways to sneak up on a guy and take him down. Assassin’s Creed met with great commercial sales, yet reviews were mixed. The majority of issues with the original stemmed from a lack of things to do. Ubisoft has pledged to keep things fresh and exciting for the sequel. Does Ezio usher in a renaissance to this ambitious series or merely stand in the shadow of Altair? 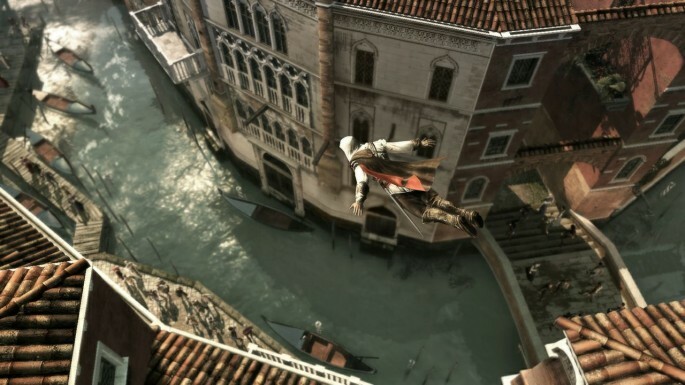 Assassin’s Creed II picks up right where the first Assassin’s Creed ended. You are still trapped within the Abstergo building being held against your will. Lucy then re-enters the room you are being held captive in and instructs you to get on the Animus. Upon doing so you are then “reborn” as Ezio Auditore in Florence, Italy during the 15th century. Ezio is a man on a mission of revenge and as the story unfolds, many things are revealed to him about his family. From the top down, there are many improvements over the original Assassin’s Creed. Control responsiveness has been revamped. Free running will still offer some difficulties at times, as the jump button is context sensitive. Once acclimated, Ezio mostly does what you want as you run across rooftops, and while the dessert climate didn’t offer Altair many areas to swim, Ezio has many opportunities to take a dip. This is especially useful when escaping from guards and Templars. Climbing is one of Ezio’s best talents and it is prominently featured. Not mastering climbing controls will lead to frustration. This isn’t that difficult as the controls are as smooth and fluid. Don’t expect to be able to just shoot up the side of buildings in this title, however. You actually have to grab onto something, be it a crevice or a pole. You must think on your feet while climing. This leads to some very exciting, and tense yet rewarding moments as you are being chased through the cities. Of course the aptly titled Assassin’s Creed features assassinations. As with any good open world game, there are a myriad of options available to the user; in fact, it can be overwhelming at times. There are a total of 22 available weapons for you to choose from. Each weapon also has its own style of moves as well. For example, if you use one of the hammers, one of my favorites, Ezio will literally crush people with it when swinging it. On the other hand, the swords and sabers provide for a much more elegant fighting style. The “hidden blade,” a staple weapon of the series, makes a return, except now Ezio wields one on each arm for twice the impact. They can be used to take out two enemies at the same time. Stealth has been enhanced by allowing for elevated takedowns with multiple animations. The amount of finishers and counters is a great addition to combat as well. You won’t be looking at the same finishing moves over and over again. However, waging war upon your enemies will tax your armor. A quick trip to the blacksmith will have it in tip top shape and ready for the battlefield. Neglecting this will guarantee a major loss of protection. Blacksmiths usually aren’t far, so this is never a big problem overall.